The University of New Hampshire campus lit up with candlelight as hundreds turned out to honor the victims of the Paris attacks. With tears in her eyes, Jourdan Strecker brings us back to last Friday night. "I didn't know what happened. I thought Paris was taken over," said Strecker, who grew up in France. Strecker's brother and sister were in Paris at the time. She lost two friends in the attacks. Wednesday, she held a candle in their honor. "I am glad we are doing something about it so we don't just forget about them," said Strecker. Hundreds of her UNH classmates joined with faculty and staff to remember the Paris attack victims and honor their families. Students say since the news broke, there's been an overwhelming sense of sadness. Strecker wishes she could be with her family in France, but she says it's her community on campus that makes her believe better days are ahead. "We will not let this bring us down," she said. "We've got each other and we can rely on each other to get through this tough time." 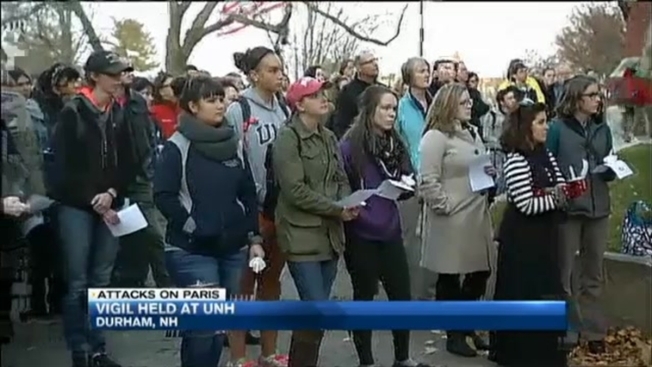 There were eight UNH students and one faculty member in Paris at the time of the attack. They're all accounted for and all of them are OK.